Our team at SERVPRO of Elk Grove / Laguna understands how devastating fire and smoke damage can be to your business or home. Our extensively trained crews have completed thousands of jobs and know what it takes to make your property "Like it never even happened." No matter what the size of job, our very experienced team is "Ready to help." We have crews and managers on-call 24 hours a day, every single day, including all holidays. Our team at SERVPRO of Elk Grove / Laguna has performed thousands of jobs. These can range from a single room residential job, to several floors of a commercial high rise building. No matter what the size of job, our very experienced team is "Ready to help." We have crews and managers on-call 24 hours a day, every single day, including all holidays. Our team at SERVPRO of Elk Grove / Laguna understands how damages to your business from fire/smoke or water/flood or mold can create major disruptions. Knowing to call the professional team at SERVPRO is the first step to recovery. Our extensively trained crews have been on thousands of job sites and know how to address each unique situation. Our goal is to address all customer needs, while making the damage "Like it never even happened." Out team at SERVPRO of Elk Grove / Laguna, understands mold growth in your business or home can be overwhelming to our customers. Knowing to call the industry leaders at SERVPRO can make all the difference. Our experienced team members have been on thousands of job sites and know how to address each unique situation. Most importantly, our team members understand the stress our customers are experiencing. We are ready to respond to your property damage needs 24 hours a day, including all holidays. Our team at SERVPRO of Elk Grove / Laguna, understands our restoration industry is constantly evolving. It is our responsibility as the industry leader to utilize the latest technology to provide our customers with the best possible service. This picture illustrates a thermal imaging camera showing the differences in surface temperatures of materials. This tool is very effective in looking at large areas, or hard to reach areas, in a short period of time. Once there are differences observed, our trained professionals know to focus on the area with more sensitive moisture meters to determine if the material is wet or not. Our team at SERVPRO of Elk Grove / Laguna, understands water damage to your business can be devastating. The interruption to your operation can cause multiple problems and even put some companies out of business. Choosing the best restoration company can reduce your exposure significantly. Our team of well training professionals is ready 24 hours a day, including all holidays. 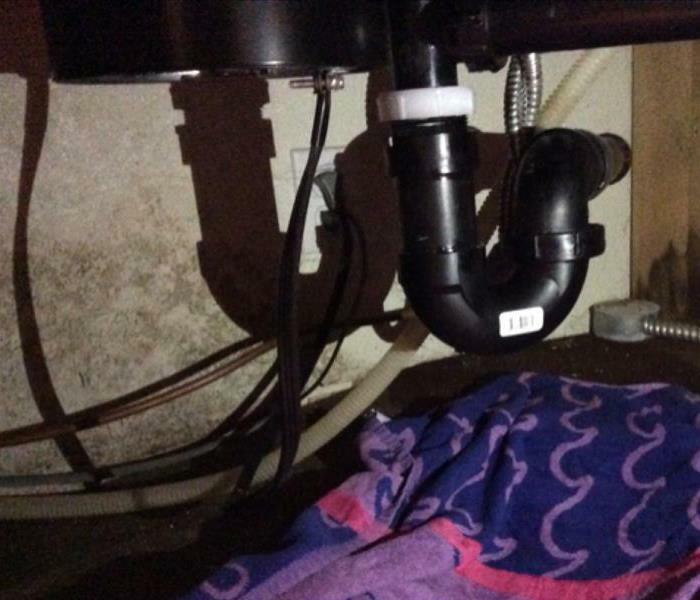 This customer discovered a slow but steady drip under his Kitchen sink. During an inspection by SERVPRO, they found the bottom of the cabinet rotted out and significant mold contamination on the wood, drywall and wood sub-floor. In 48 hours, the professional crew at SERVPRO had remediated all the mold contaminated materials and the remaining materials dried. This large commercial building sustained significant water damage and flooding from a fire sprinkler discharge. Approximately 5000 square feet of retail space was affected and required water extraction and drying equipment. The professionals at SERVPRO had the entire store open for business first thing in the morning. There was an electrical fire in this house which caused large amounts of soot to cover the interior of the home. If soot is not removed quickly, the acidity of the soot can cause etching or pitting to finished or polished surfaces. This dimming effect can be permanent and ruin the material. A quick response and thorough inspection can prevent these permanent damages. This washing machine malfunctioned and flooded several rooms of this house. A quick response by the professionals at SERVPRO limited the water damage and had the house ready for repairs in 48 hours. Water damages and floods require a quick response to shorten drying times, reduce expenses and get the customer back to normal as soon as possible. In addition to water, fire, smoke and mold damages, the expert crews at SERVPRO perform commercial cleanups after construction. This photo illustrates the heavy amount of dust and dirt build up after construction or repairs. This carpet was wet from a water damage for a few days while the customer was on vacation. The mold contamination was growing on the back of the carpet, on the carpet pad and on the concrete floor. The mold growth was not digesting the concrete, but instead was digesting the over spray of paint from the original construction of the home. After a wind a rain storm, this customer move a picture on the wall to find mold growth. When the experts at SERVPRO inspected her home, the crew discovered the customer had a roof leak from the wind, which caused water damage to the exterior wall. The drywall started to dry, but where the picture was, there was no air flow and the drywall remained wet. After several days, mold growth began behind the picture. Almost any plumbing fixture is capable of having the main sewer line backup grossly contaminated water into it. In these types of floods, safety is the utmost priority. The water which comes from the sewer usually contains bacteria and viruses that can be life long problems for humans if they become infected. This customer had a slow leak water damage in the wall behind their shower. When the customer saw their baseboard was wet and swollen in the room behind the shower, they knew to call the professionals at SERVPRO for help. After removing the baseboard and finding mold, the experienced crew knew to remove the drywall to find the much larger problem behind the shower. When water damage or flooding is not addressed quickly, mold growth can occur and increase the scope and expense of the job. This baseboard was only wet for 48 hours before mold growth started. There was also mold growth in the wall cavity so the drywall needed to be removed, instead of dried. This customer was gone on vacation when a heavy rain storm arrived. A large tree in their backyard fell on to their roof and cracked several tiles, which allowed large amounts of water to flood their attic and ceiling. The water damage was extensive in several rooms of the house. Mold growth thrives in contained areas with very little air flow. When excess water in drywall and wood studs is left for days or weeks, often times mold growth occurs. At this point, the affected drywall should be removed and the wood studs require mold remediation procedures. These steps are significantly more costly than drying them out when the flooding occurred. The expert professionals at SERVPRO are trained and equipped with the latest tools to detect excess moisture and monitor the drying process. In this photo, a technician uses a hammer probe to test the moisture levels deep inside wood framing. The use of containment barriers and heavy duty cardboard rolls are essential to protecting parts of the structure from further damage. The restoration professionals at SERVPRO are heavily trained to prevent further damage during restoration. Containment barriers are a major tool which SERVPRO professionals use on a daily basis. These barriers are easy to install and can limit dust contamination during demolition. The barriers also limit the drying area to speed up the drying process. During a heavy rain storm, this customer's roof gutter clogged with leaves and caused water to flood the attic. The excess water soaked the upstairs closet walls and carpet. 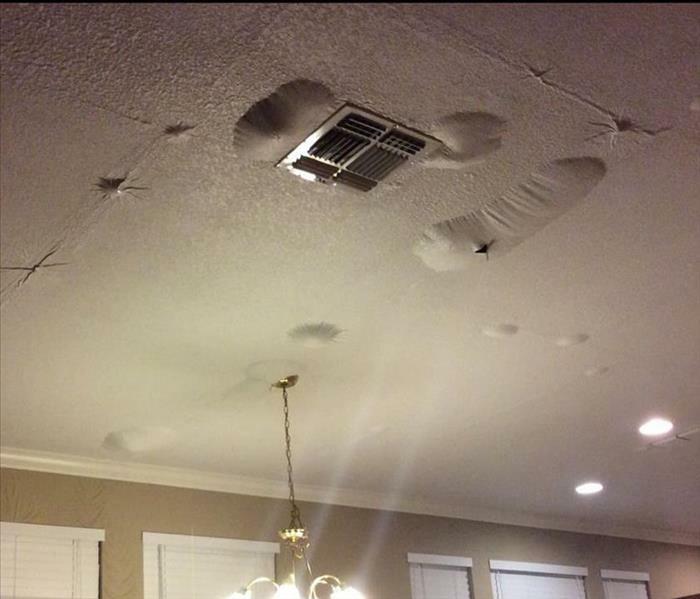 Then the excess water collapsed the drywall ceiling in their living room on the first floor. When a water damage saturates wood flooring, the results can be very visual. 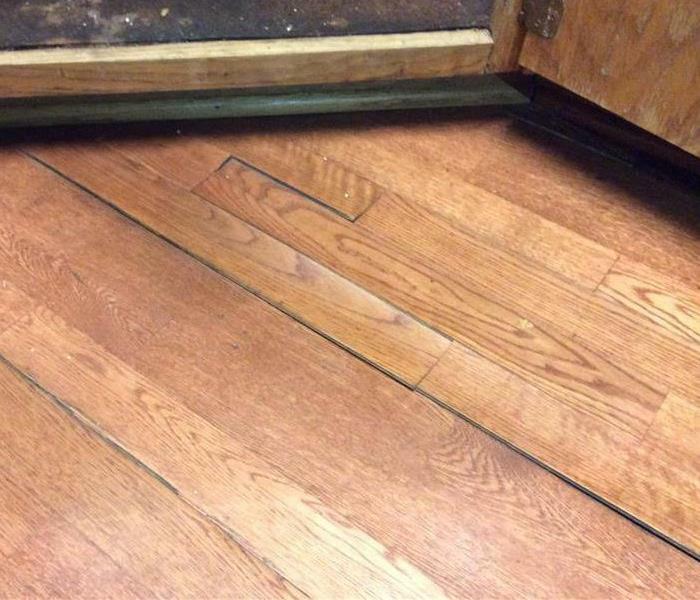 Here is a photo of the wood floor "cupping" due to water entering the edges of the wood joints and causing swelling. This customer found extensive mold contamination under their Kitchen sink. They knew to call the experts at SERVPRO for professional assistance with their mold remediation. Knowing who to call is a major step in the right direction for any project. Our professional crews are available 24 hours a day, 365 days a year, including holidays. 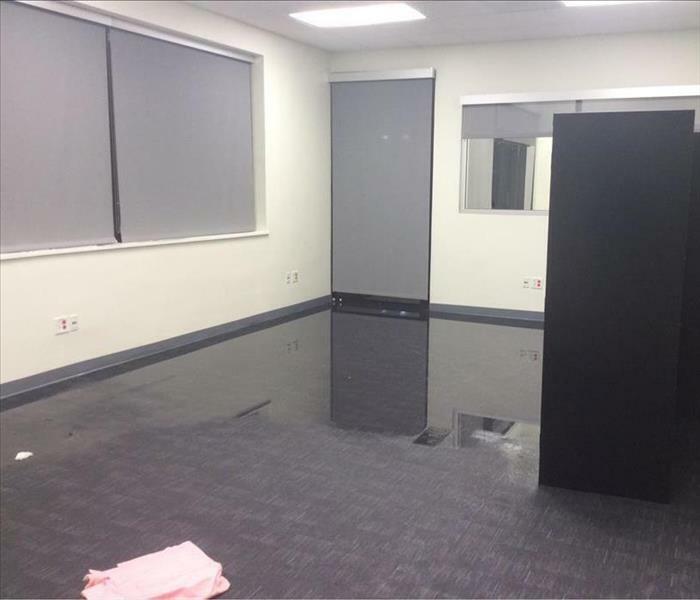 This commercial facility sustained a major water damage and flooding over a holiday weekend. The damage would have multiplied if the response team waited until the next business day. The commercial facility had a water pipe break on the second floor. This caused significant flooding to the main level below. The main level drop ceiling, insulation and drywall all needed to be removed. Commercial drying equipment was installed to dry the wood framing. In this photo, a water damage in a master bedroom flooded into the carpet and walls of the master bedroom. This caused damage to the wooden legs of the bed and dresser. This photo illustrates the use of thermal imaging to pin point water damage during an inspection. Our trained professionals utilize this technology to quickly find water damage and sources of water intrusion. This photo shows the line of soot on some blinds after a wildfire nearby. Detailed cleaning needs to be performed so odors and visible staining don't lead to replacement of the blinds, instead of cleaning the blinds. 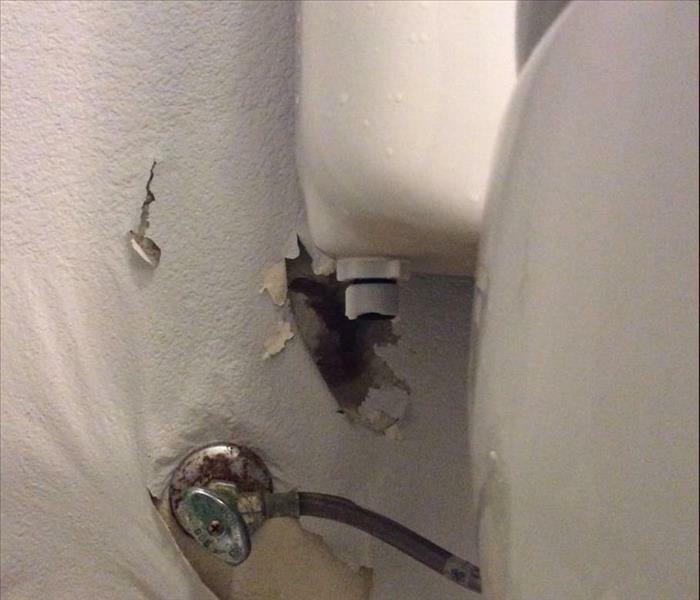 One of the most common water damage source is from a broken supply line behind toilet. This source can cause up to 4 gallons per minute to flood the house or building. When water damages or floods happen upstairs, the damage can be extensive downstairs. This entire downstairs room needed to have all of the drywall removed because it was pulling away from the wood studs. The removal of the drywall also allowed faster and more thorough drying of the wood studs so repairs could get started. Wildfires are very devastating and SERVPRO of Elk Grove / Laguna is there to help. This wildfire burned hundreds of homes, far away from the Sacramento region. However, SERVPRO of Elk Grove / Laguna is dedicated to helping people inneed, even when they are far away. We mobilized a team of workers and assisted with the cleanup of the houses that were spared by the fire. Commercial buildings are often filled with glued down carpet. When a flood or water damage happens, the carpet needs to be extracted right away to prevent the glue from breaking down. This photo illustrates how much water can be removed during the extraction process. A quick response can be the difference between saving or replacing the carpet after a flood or water damage. This is our new commercial sized ozone chamber, with 2300 cu. ft. of space for cleaning and deodorization of furniture, rugs and contents. This room is used for cleaning heavily odored contents as well, so that the odors do not travel through the rest of the warehouse. This customer had a fire on the weekend and needed an immediate assessment of their house. We responded within the hour and provided the expertise the customer needed. Time is always a factor when helping our customers. This customer had an electrical fire and needed some expert help. They called SERVPRO and were amazed at the results. Our certified and well trained crews were able to get their bathroom cleaned up in one day!